At Emily's Bakery and Deli your choices are endless. 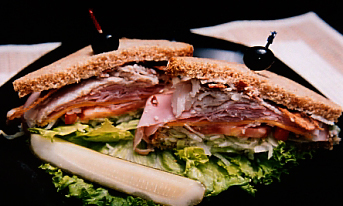 Build your own sandwich by choosing a type of meat or sandwich spread and a made-from-scratch bread. Top it with a slice of cheese and your favorite fixings. Half sandwiches also are available. All sandwiches are served with a pickle spear. Today's special sandwich and the soup choices are posted on our chalkboard. A made-from-scratch savory blend of eggs, meat, pototoes and cheeses. Available in ham, bacon and sausage. Specialty Sandwiches All sandwiches served with a pickle spear. A tasty combination of turkey breast, ham, cheddar cheese and bacon with lettuce, tomato, onion and mayo on the bread of your choice. Generous portions of turkey breast, roast beef, ham, cheddar cheese, lettuce, tomato and mayo on pumpernickel bread. A white or wheat bun topped with lettuce, tomato, onion, cheddar and swiss cheeses, turkey breast, ham and our special creamy dressing. This vegetarian sandwich is a combination of monterey jack, cheddar and havarti cheeses on our nutritious seven-grain bread with lettuce, tomato, onion, sprouts and creamy garlic dressing. The Elmer . . . . . prices vary. This lunch for one includes a full sandwich, a 5 oz. salad, a pickle spear and a bakery treat. Great for kids! A half sandwich with ham or peanut butter and jelly, a fruit cup, a small bag of chips and a cookie. Create your Trio Salad Plate by choosing three 5-ounce salads from our daily display. Add a hardroll or two breadsticks for a great meal. We feature homemade soups, the perfect accompaniment to one of our delicious salads or sandwiches. Soups to go, too! Try your wrap grilled . . . .
Today's hot entree alternates between our pecanwood smoked pulled pork and our shredded hickory chicken. Both are served on an Emily's-own specialty bun with potato chips and a pickle spear. 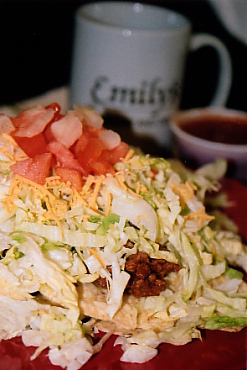 Taco Salad made with corn chips, seasoned ground beef, lettuce, shredded cheddar cheese, diced tomatoes and onions. Served with a side of both mild salsa and sour cream. Laurie's Famous Sloppy Joe on a Kaiser bun, served with chips and pickle spear. Pizza hoagie panini made with pepperoni, ham, provolone and Co-Jack cheese, with marinara sauce on a cheese & Italian-seasoned hoagie grilled to perfection. Optional fixings: red & green bell peppers, onion and black olives. Join Emily's daily fax list! 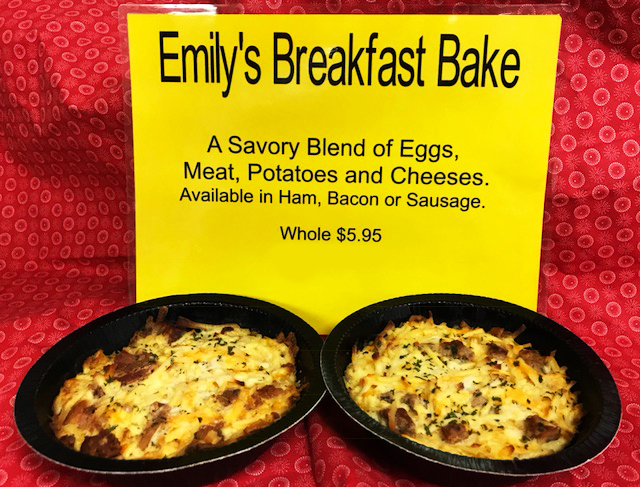 Find out just what's cookin' at Emily's. Each day, we'll send you a fax that gives our daily special, soups and salads of the day, as well as our features. We also highlight our sale items, upcoming hot entrees and new products. Just call us at 651-437-2491 or 651-437-3338 to give us your fax number.